At EverLine Coatings we offer a number of interior line painting services to Winnipeg and area businesses. These services include safety and production flow floor markings, plant and warehouse forklift traffic line markings and parking garage and parkade line painting. At EverLine Coatings and Services we specialize in providing high-quality interior line painting services in Winnipeg. 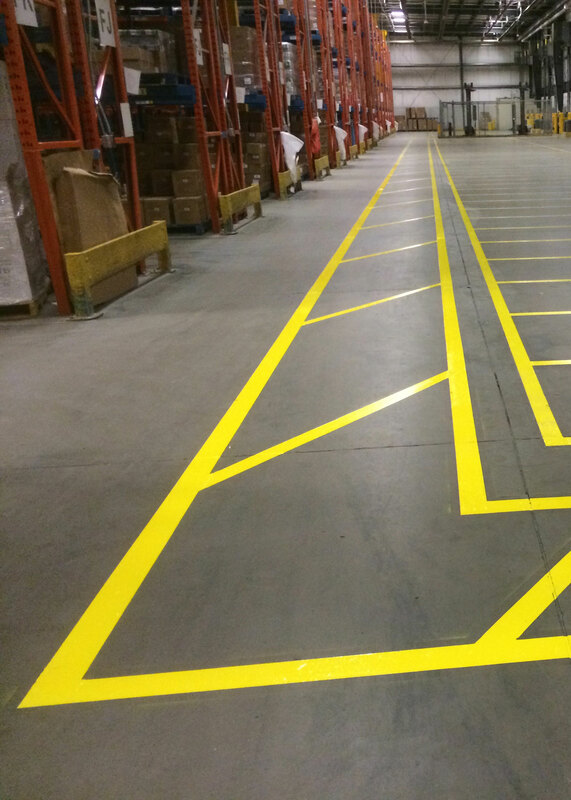 If your business requires forklift traffic markings, production flow markings, or any other kind of floor marking project that your business may require; EverLine Coatings and Services can provide accurate and durable markings to keep your business running smoothly. Our experienced interior line painting crews have an extensive amount of experience working in a variety of warehouses and workspaces in Winnipeg. They have provided many different kinds of interior line painting services for businesses in Winnipeg and are ready to help you with any interior line painting services that your business may need. We provide a number of different painting products and materials so we can provide accurate and durable line painting solutions to any type of floor that you may have. The variety of materials, products, and our state of the art application processes enable us to work with your business and ensure that your next interior line painting project in Winnipeg fits within your budget and exceeds your expectations. At EverLine Coatings and Services, we are business owners too. We understand that your business cannot afford to have any unnecessary interruptions to regular business operations. This is why we employ several expert Winnipeg interior line painting crews that can complete your interior line painting project around your company’s schedule. Whether you need us to paint in between production runs or while your business is shut down for the night, our Winnipeg interior line painters can provide their services when it is convenient for your business. Having multiple interior line painting crews also enables us to provide our line painting services immediately in the event of an emergency. No matter how tight your timeline is, the experienced interior line painters at EverLine Coatings and Services are ready to help. If your business requires interior line painting in Winnipeg, look no further. EverLine Coatings and Services is the premier interior line painting service in Winnipeg and its surrounding areas. At EverLine Coatings and Services, we have decades of experience painting interior line markings for numerous different applications. Our unmatched amount of industry experience has us at the forefront of the industry. No matter what the surface is or what kind of space needs interior line painting services, we have seen and done it all before, and we are prepared to deliver exceptional results every time. We have completed all kinds of designs in all types of interiors so we know not only can we handle your job, we will exceed your expectations. One of the leading advantages provided by EverLine Coatings and Services is our ability to provide our interior line painting services in Winnipeg during your businesses off hours. At EverLine Coatings and Services, we understand that your business cannot afford interruptions during regular operating hours. This is why we offer our services with application periods at night and on weekends. This means you do not need to stop your operations or productions to have your interior line painting project completed. We also offer the most durable products on the market. This means when EverLine completes an interior line painting project, it will last considerably longer than the line painting projects completed by our competitors. There are a number of Factors that make the Winnipeg line painting experts at EverLine Coatings and Services the industry’s best interior line painters. Our unwavering commitment to delivering quality and results that exceed our client’s expectations is what also makes us better than any other interior line painting contractors in Winnipeg. At EverLine Coatings and Services, we are committed to continually training our crews to ensure that they are the best of the best. We are continuously innovating and always finding ways to deliver better looking and more efficient services for our clients. In addition to innovating the way we provide interior line painting services in Winnipeg, we provide our crews with top of the line equipment and the best line painting products available. We believe that a crew that has been thoroughly trained with the latest equipment, products, and application processes is the best way to deliver expectation shattering results for our clients. When it comes to choosing a company to handle your next interior line painting project, choose the experts at Everline Coatings and Services. If you are having the EverLine interior line painters in Winnipeg complete an interior line painting project for you soon, there are a few things you can do before our crew’s arrival to ensure a quality result and a timely application. Please ensure that the surface to be painted has been cleaned before our arrival. This is critical for us to be able to provide an accurate finish and ensure a long-lasting line painting application. Also, make sure that any obstacles and debris have been removed from the area being painted. Having a clear working area enables our crews to work efficiently. Finally, please put up signs or notices around the area that is being painted. This will ensure the safety of our crews, limit the number of distractions for a timely completion, and finally, that no one walks through wet paint. At EverLine Coatings and Services, we strive to provide the best possible value for our clients with every job that we complete. Because of this, we evaluate the price of our projects on a per job basis. This is because many different factors can impact the scope of the project and every businesses needs are different. We take the time to understand your business, the details of your project and your budget so that we can offer services that will exceed your expectations within your unique budget. To receive a quote for your upcoming interior line painting project, please contact us.